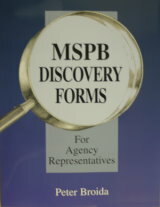 MSPB Discovery Forms For Agency Representatives provides samples of written discovery to help agency officials fully develop defenses and evidence concerning the remedy demanded. The discovery forms are taken from actual litigation in which agencies effectively used discovery in appeals before the MSPB. Sample interrogatories, document requests, requests for admissions, instructions, and definitions are all topically classified by the principal types of cases within the jurisdiction of the MSPB. Also available as a .pdf file on a CD-ROM or as an ebook for instant download, making it possible to copy and paste materials for use in drafting discovery requests in pending litigation.